Oh Snap! The Friggin Amazing J.Ho Sketchblog...: One Year Later! Well, here we are--the one year bloggiversary of Oh Snap! The Friggin Amazing J.Ho Sketchblog. You see, bloggiversary is a super clever portmanteau of the word "blog" and the word "anniversary." Have I ever mentioned that I hate the word "portmanteau?" What was I talking about? Oh yeah, so, I've managed to stick it out for a year so far, without missing a single post, and I have no intention of stopping any time soon. If you had any idea how lazy/unmotivated/lethargic/quitty I am in RL, you'd be impressed. But whether or not you're impressed, I thank you, Dear Reader for tuning in. Whether you're a crony who's known me since I was in grade school, or someone who randomly stumbled upon this blog, or anyone in between, I appreciate your patronage, and wish you a safe and happy New Year. 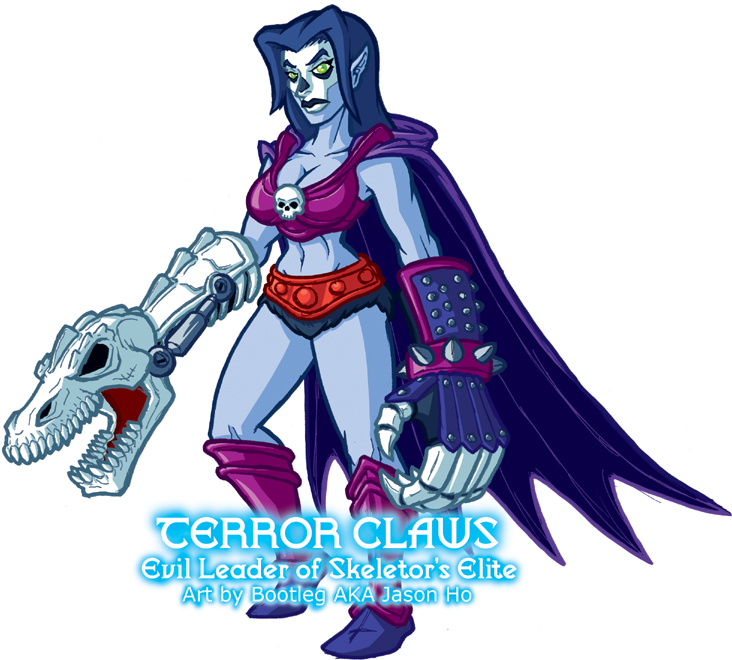 PROFILE: Named after the sacred Infinitan artifact weapons which she wields in combat, TERROR CLAWS is the fearsome leader of Skeletor's Elite--a group of powerful warrior-mages handpicked and trained by the Lord of Destruction himself. In hand-to-hand combat, her namesake claws can effortlessly rend through the toughest armored units of the Eternian military, and enhance her strength to a level possibly rivalling He-Man's. In ranged combat, she wields a dragon-skull arm cannon, created by Dragon Blaster. Terror Claws is a seasoned magic-user as well, specializing in scrying, enchantments, and counterspells. Terror Claws' true power, however, is her ability to lead. Cool, collected, and meticulous, in Skeletor's absence, she has been able to wrangle and lead Skeletor's Elite, as well as his other forces. Even the mutinous Evil-Lyn cannot deny Terror Claws' efficiency as a leader. 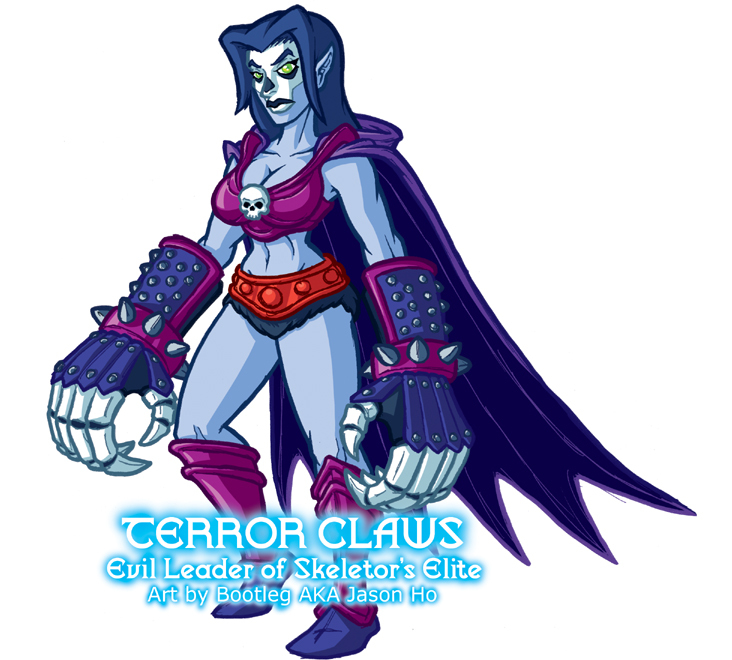 Unlike her fellow Elite, Terror Claws possesses a sense of honor that extends beyond her fealty to Skeletor. This "defect" did not escape Skeletor's attention--on the contrary, he felt it would be a weakness that he could exploit to insure her continuing loyalty. Terror Claws has no obvious weaknesses, but it seems inevitable that she will be drawn into a confrontation with Evil-Lyn. HISTORY: An orphaned Infinitan girl with no memory of her past, was brought to Skeletor's attention because of her unusually advanced magic capabilities. Inexplicably drawn to her, Skeletor inducted the orphan girl into the Elite training program. In spite of being one of the later recruits, and one of the youngest, she rapidly rose through the ranks. Is her loyalty to Skeletor a true testament to the power of the Elite re-education system... or does Terror Claws have an as yet unrevealed motive?" Okay, I had that toy, and it was one of my favorites (even though I lost one of the claws the FIRST FREAKIN' DAY I HAD IT! ), but damned if I didn't look at it the first time and wonder what was up with Skeletor's halter top! ack... stories of childhood toy loss are heartwrenching to me, even as a grown man. stories of skull-faced supervillains in halter tops are also heartwrenching to me.